DES MOINES – The Iowa Barnstormers have once again partnered with the Animal Rescue League of Iowa to host a halftime Corgi Chase on Saturday, April 14. Kickoff is set for 7:05 p.m. CDT at Wells Fargo Arena. 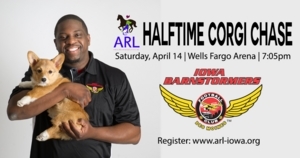 The Iowa Barnstormers have partnered with the Animal Rescue League of Iowa (ARL) for the Second Annual Halftime Corgi Chase at their game on Saturday, April 14. Corgi owners are invited to register their Corgis and mixed-breed Corgis to race down the field at halftime, with the winner taking home a prize. Registration for this event is just $25 and includes two tickets to the Iowa Barnstormers vs. Nebraska Danger game. Single tickets to the game are also available through the ARL for just $10. The Corgi Chase is a non-competitive fundraising initiative for the Animal Rescue League of Iowa, with a portion of all Corgi Chase registrations and ARL ticket sales benefitting their organization. Participants are invited to register their Corgis or purchase tickets by visiting www.arl-iowa.org. The Iowa Barnstormers first introduced the Corgi Chase in 2017. The event was a huge success, seeing 50 dogs compete in the inaugural race. As a result, a total of $1,265 was raised for the ARL. The Barnstormers hope to top that this year. The ARL was founded in 1926 and is Iowa’s largest nonprofit animal shelter, caring for many thousands of pets each year. The ARL serves people and pets from across the state of Iowa through its programs, which include pet adoption, human education, pet behavior training, spay/neuter, animal cruelty intervention, and much more. To make a donation to the ARL or learn more about the Iowa Barnstormers and ARL Corgi Chase, visit www.arl-iowa.org or contact Chris Hubbard (chubbard@arl-iowa.org).